Florida is an equitable distribution jurisdiction. When a couple divorces, courts are guided by principles of equity when dividing up martial assets. Courts typically begin with a 50/50 split of marital property then apply guiding Florida statutes to make the division of property fairer to each spouse. However, courts may not be able to divide up all assets during a divorce. Courts cannot divide non-martial property, also known as separate property, between two spouses. In high asset divorces, which may involve extensive assets and property, it is critical for spouses to determine what is marital property and what is separate property. Florida law provides guiding factors, but ultimately the division of assets is left to the court’s discretion. Assets such as a house, car, and investment income that are acquired after the wedding day are considered marital property. It does not matter which spouse acquired the property, which spouse used the property or even which spouse’s name appears on the title of the asset. For example, if a spouse purchases a car with their own money and puts only their name on the title, the car is still considered marital property. Simply stated, if the property was acquired during the marriage, it is most likely considered marital property. However, sometimes an asset is purchased with separate monies acquired before the marriage, in this scenario, that asset could be deemed separate. Under some circumstances, non-marital property that is acquired prior to the marriage may be enhanced or appreciate in value during the marriage. The enhancement may be the result of one or both of the spouses’ efforts, or because one or both spouses spent marital funds to improve the asset. Although the asset itself was not originally marital property, the difference between the asset’s increased present value and the asset’s value before the marriage is considered marital property. Take, for instance, a house that is purchased by one spouse prior to marriage. This spouse’s name appears on the mortgage and the title of the house. From the beginning of the marriage, the house is considered separate property, belonging only to the purchasing spouse. As time goes by, both spouses make improvements to the house – new kitchen appliances, wood floors and a new roof – all of which increase the value of the house. The increased value, or the enhancement, of the house would be considered marital property. When one spouse gives the other a gift, they do not intend to give it to themselves. Yet that is essentially what happens when they make a gift. Spousal gifts are considered marital property belonging to both spouses, not just the spouse receiving the gift. 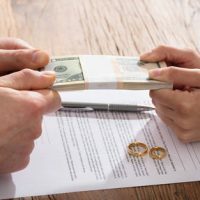 It may seem counterintuitive, but the court’s treatment of spousal gifts as marital property can ensure the equitable distribution of marital assets. Consider a husband that purchases a new car for his wife. Even if he purchases the car with his own money and puts the car title in his wife’s name, it is still considered marital property. The wife may be able to keep the car, but only if the value of the car owed to the husband is offset by some other asset. The law is designed to prevent a windfall going to the receiving spouse. When married couples save for retirement, they envision saving for a future together. They may strategically decide that one spouse will max out his or her 401(k) or IRA contributions while the other puts money toward everyday expenses. To ensure that one spouse is not left behind after divorce, courts will consider these types of assets as marital property. Vested and non-vested retirement benefits, rights and retirement funds that accrue value during marriage are considered to be marital property. The value may come from a retirement plan, life insurance plan or deferred compensation, and determining the value of the asset can be complicated and require the help of a valuation expert. Property, real or personal, that is held by spouses as tenants by the entireties is presumed by courts to be a marital asset. Tenants by the entireties is a form of property ownership that can only be granted to married couples. To qualify, the property must be granted by the same instrument to a married couple and subject to identical ownership and joint control. Married couples may choose to receive property as tenants by the entirety in order to enjoy some of the protections this form of ownership provides, however, courts will treat the property as a marital asset. If you are going through a high asset divorce and have questions about the division of martial and non-marital assets, you can contact our family law attorneys at Arwani Law Firm ,. We have handled complicated high conflict divorces, and we are confident that our team can provide you with the legal assistance and attention that your case requires.